This photo, taken in August by the Cassini orbiter, shows Saturn, Janus and Mimas as well as the planet's distinctive rings. 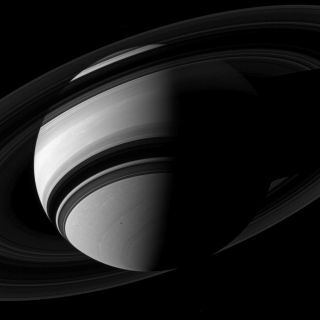 NASA has unveiled amazing new views of the planet Saturn showcasing the ringed wonder's moons, rings and turbulent atmosphere as seen by the Cassini spacecraft. The first photo, which NASA released on Christmas Eve (Dec. 24), clearly shows Saturn's south pole and distinctive rings. But the image also holds a few surprises. The shadow of Saturn's moon Mimas appears in the photo as a small, oblique dark spot slightly to the left and above the planet's south pole. Mimas is perhaps best known for a huge crater that dominates one of its hemispheres, leading some "Star Wars" fans to compare its look to the "Death Star." This image, captured by the Cassini orbiter on Christmas Eve (Dec. 24) and beamed to Earth on Dec. 26., shows details of Saturn's turbulent surface. A second Saturn photo, a raw, unprocessed view released Wednesday (Dec. 26), shows Saturn's turbulent surface in extreme detail. Violent storms churning among Saturn's cloud tops appear as delicate whorls and swirls. Both of the new Saturn photos were taken with Cassini's wide-angle camera, but they represent two different ways NASA handles space images. The first photo of Saturn, Janus and Mimas was refined to bring out the most interesting aspects of the photos. For example, Janus was barely visible in the original, raw image, so image specialists opted to brighten the small moon in the final, refined image. The second image is part of a larger database of raw images that NASA releases online soon after they are sent to Earth by Cassini. Like the first photo, this somewhat foggy depiction of Saturn's surface will eventually be treated to bring out its most stunning aspects. The Cassini spacecraft has logged more than 3.8 billion miles (6.1 billion km) since its launch with the Huygens lander in 1997. Cassini arrived at Saturn in 2004 and dropped European-built Huygens onto the surface of Saturn's moon Titan. The Cassini- Huygens mission is a joint project of NASA, the Italian Space Agency and the European Space Agency. During its time in space, Cassini has taken more than 300,000 images of the Saturn and its moons. The spacecraft is currently in an extended phase of its mission that runs through 2017.